The third of five promised free characters arrived today for Battleborn, the game that makes me sad every time I write about it. He’s a pink bird. They’ve also revealed a kid in a mech suit as character number four. That’s pretty cool, right? I should not be sad while watching a video of a pink bird firing missiles and sounding vaguely like Mr. T. No one should. Did I mention his name is Ernest? Maybe I should have led with that. 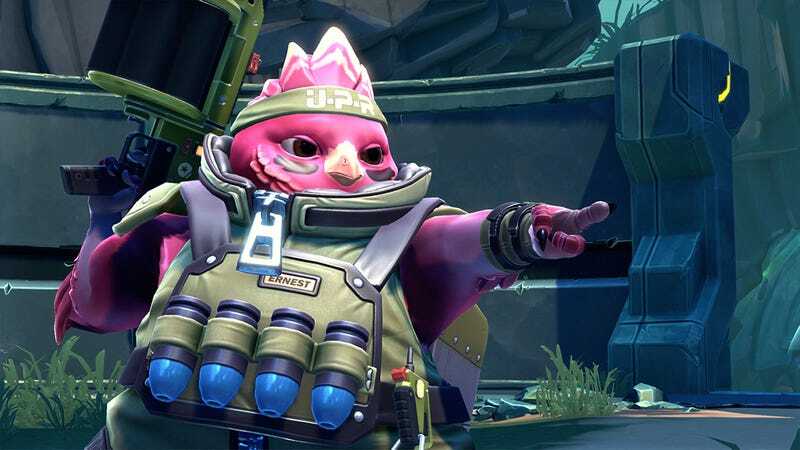 For those of you who’ve just joined us, I really like Battleborn, Gearbox Softwares oddball take on the MOBA-ish genre.It’s a good game that’s had everything go wrong for it, from launching just before Overwatch to launching just before Overwatch, weeks before Overwatch was released. Here’s the next new character, Kid Ultra. He’ll be out eventually. Maybe the concurrents will be up by then, and more than 900 people will be playing on average on Steam. Bless Battleborn’s heart.